Over 14,000 new companies were registered in Ireland last year and it is into this melting pot that BulletHQ primarily plies its trade. 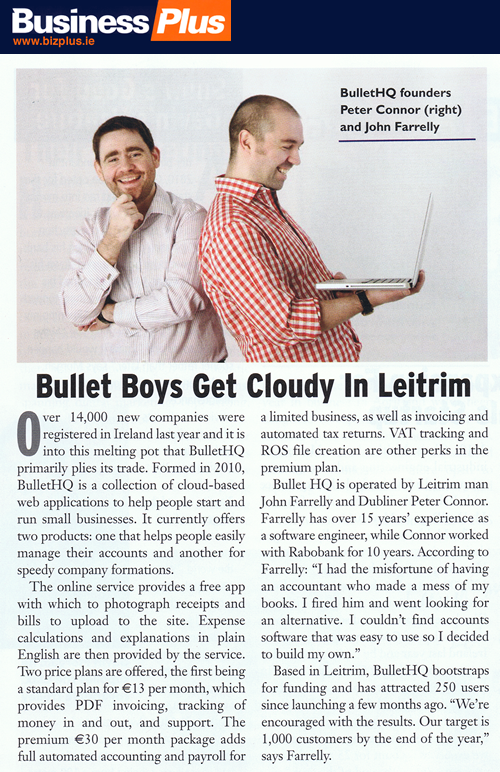 Formed in 2010, BulletHQ is a collection of cloud-based web applications to help people start and run small businesses. It currently offers two products: one that helps people easily manage their accounts and another for speedy company formations. The online service provides a free app with which to phototgraph receipts and bills to upload to the site. Expense calculations and explanations in plain English are them provided by the service. Two price plans are offered, the first being a standard plan for €13 per month, which provides PDF invoicing, tracking of money in and out, and support. The premium €30 per month package adds full automated accounting and payroll for a limited business, as well as invoicing and tax returns VAT tracking and ROS file creation are other perks in the premium plan. Based in Leitrim, BulletHQ bootstraps for funding and has attracted 250 users since launching a few months ago. “We’re encouraged with the results. Our target is 1,000 customers by the end of the year” says Farrelly.